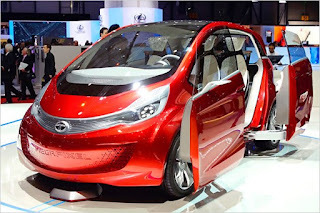 It is indeed surprising to see a futuristic vehicle such as the ‘Megapixel’ by home grown automaker Tata Motors. Tata Motors has been known from decades for its value engineering and something like the MegaPixel as the first from the company, of course after the Pixel small car. Tata Motors has unveiled ‘MegaPixel’ concept micro car at the ongoing 82nd Geneva Motor Show. According to a Tata Motors spokesperson, the ‘MegaPixel’ is the result of the progress the company has made on the Pixel microcar which was unveiled last year. Unlike the Pixel which had scissor doors, the ‘MegaPixel’ has intelligent sliding door which help in easy access to the car. The ‘MegaPixel’ reflects the future of mobility with new and innovative technological features which makes driving much easier and efficient. The MegaPixel is driven by four independent electric motors mounted on each wheel which is powered by a 13kWh lithium-ion phosphate battery pack giving the car an all electric range of 86 km. The batteries are charged using an induction charging system that is you need to park the car just below the induction charging unit and the car battery gets charged. In case the battery power gets exhausted, a 30 Bhp 325cc single cylinder petrol engine kicks in to extend the range up to over 900 km. The car can reach a maximum speed of 110 Kmph. The most impressive feature of the ‘MegaPixel’ is its turning circle radius of just 2.8 meters. The parking assist system helps the car is very tight parking places. The car sports some of the unique features such as floating seats, rear projected HMI, interface controller and front and rear sling doors. The ventilation, driving modes, temperature and performance of the car can be controlled using a smart phone that docks with the center console. Will the car cost the value of double of lombardini or thribble the valie of audi branded car of 38 lakhs?? After all only 4 can go in.. Seems it will have a price tag of a chopper helicopter.. The bab tata is o.k but his nano has no resale value.. Asking for just half less after using for 6 months.. It is good for we 2 ours one,,, and not for we 2.. Ours three..